Every family has its secrets, and the individuals in this book have secrets which link people together in the most engaging ways. It kept me awake as I was so keen to discover how this elegantly plotted and well written novel would develop. The links between the generations are often touching and far from obvious; this is not a novel where the actions of the characters will immediately lead to certain outcomes, yet there is always goodwill to be observed. It is has a complex, mature plot, but the development of the individual stories are made clear through the characters who are understandable and realistic. While there are shifts in the chronological settings, the quality of the writing is such that it is immediately apparent the difference in the people concerned, and indeed how they will react to events. I was extremely pleased to receive a copy of this book to read and review as part of a blog tour. The book opens with a small incident of the discovery of an envelope, which seems disassociated from the story of two factory hands involved in a strike back in 1911. Their story continues as they meet with misfortune and unfairness. The time and place changes to show a young woman and her parents in 1954, the older woman carefully sewing on a machine. Fred is the next character to appear, newly arrived in the flat where his much loved grandfather died. The time is now 2016, and Fred is finding that he must get used to many things, including a resident cat. I really enjoyed his blog and story, as he begins to accept that his mother is going on a long trip, and he must fend for himself in a new setting with little money. Throughout the book the story travels back and forth, as some of the characters cope with the First World War, loss and change. 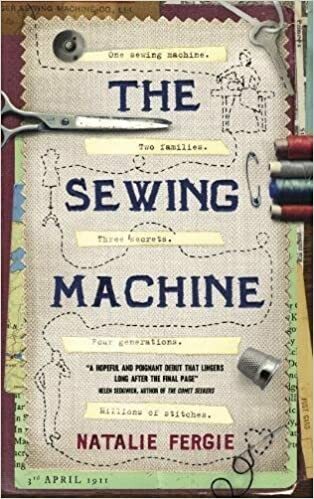 At all points this book maintains some optimism in each narrative strand; this is in no sense a grim book as one character constructs notebooks to record every sewing project undertaken. Fred meanwhile finds a machine which he does not understand, but finds that there is a way of improvising in the old fashioned flat. Any guesses that the reader makes as to possible outcomes do not come quickly, but the journey is most enjoyable. This is such a good read, yet it is difficult to explain how exactly. It is not a grim tale, though there are some sad events and challenges that the characters work through. The link of the machine is an unusual one, but adds to the touching and tender elements of the tale. The role of the women is a strong one, especially as a very modern woman enters the story. The observation of each of the settings is acute so that it is possible to visualise each item and room, and more importantly each character comes alive. In this clever and subtle book there is so much to admire and enjoy, and I recommend it as a most memorable book. I am a little later posting this as yesterday we were in London. I managed to get to the Persephone book shop, which I would recommend to anyone if you find yourself in that part of London. It is such a friendly shop, and of course it sells all 130 books – each and every one a gem. If London is not a possibility, do look at https://www.persephonebooks.co.uk/ – if you enjoy reading at all, there will be so much to tempt you!